Its a little know fact that there's a watch-making company based in London, England, which shares the same name as 'Stormwatch'. Yeah. I'm not kidding you, pal. I've been following them on twitter and everything. But then again, that's most probably why I've always got the time to read this comic book created by Jim Starlin, Yvel Guichet, plus the Publisher: DC Comics, in February, 2014. To QUOTE Henny Youngman: 'Take my wife -- please'. 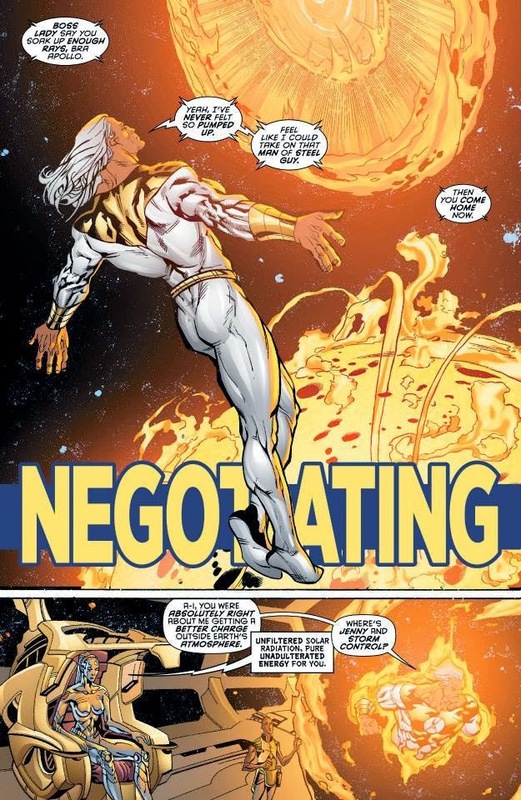 This issue of Stormwatch, entitled 'Negotiating', is a tale easily divisible by two. Whilst the main brunt of it deals with AI, Jenny Soul, Apollo, and Hellstrike, all approaching the intergalactic despot, called Extremax, hoping he'll ally himself with them against a common enemy, The Kollective. The rest of this story involves Storm Control investigating the circumstances surrounding J'onn J'onzz spying on his team. Overall I'd say that this issue of 'Stormwatch' was a fairly fine read. Nothing outstanding mind you! But it was a marked improvement on last issues offerings, mainly because it was told in a very clear and concise manner, plus it had a very evolving way about developing its pretext, particularly that part involving Storm Control and J'onn J'onzz. Well, to put it in laymen's terms, there was one scene in this issue which literally sent shivers up my spine. It was in that scene where Storm Control took off his helmet and clothes, only to reveal the Martian Manhunter underneath. OK. I admit. By this stage I knew that SC was going to investigate MM one way or another. But I tell you something for nothing, there was another part of me that thought Storm and J'onn were one and the same person, literally making my head tilt into a spin. Still, in spite of my uncertainty, could it be possible that my presumption was true? Especially when you take into consideration that J'onn was a member of this team in a previous incarnation? Food for thought, isn't it? I suppose there were only two aspects about this adventure I wasn't very happy about. Firstly, I wasn't very keen on that scene where A.I. used Jenny Soul as a bargaining tool to seal her proposition with Extremax. In my eyes it just came across very coquettish in nature, as if this robotic life form just said, 'Here, bad guy. See this girl. She can kill our enemies for us. So lets be friends, OK!'. And secondly, I feel that I would've enjoyed this tale more than I did, if it's 'Storm Control sub-plot' took more of a center stage, because I found it a more intriguing premise to follow than main brunt of the story. The only real reasons why I think the Fun's song, 'We Are Young', is a pretty decent match to this story-line, is mainly because of that scene where A.I. tries to pimp out Jenny Soul to Extremax. Think about it. You know it makes sense. Alright. I know this will sound rather strange. Yet I have to say that this dual-stranded story-line reminded me of the... coff-coff... known television personality, Khloe Kardashian. Although what she has on offer is rather nice to behold, in the same breath you'd rather know what her sister Kim has going on under her dress. Despite not being too keen on the artwork, and occasionally not enjoying the direction this series is being taken in, all in all I'd say that 'Stormwatch' is a very stimulating and creative comic book to follow. Well, let's face it. 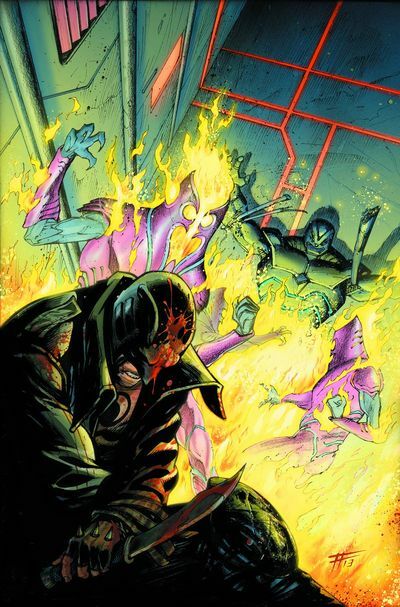 Have you ever seen a team comprising of old Wildstorm characters plus a few DC's mainstays? I haven't. And trust me. I read a lot more comic books than I actually review. Furthermore, I do like the 'space feel' this book has got in spades. It's as though Jim Starlin has somehow captured the essence of a cosmic adventure, and then distilled it through a celestial funnel that's one part bold, and one part timely. Yes. That's correct. I used the word 'timely'. Maybe this has something to do with Jim's characterization or Yvel's artwork. Yet there is something about this creative team that has a real eighties vibe about them, because they always seem to keep us on our toes in a clearly lit manner, whilst cosmetically plying us with concepts and ideas that are slightly original yet slightly conformist at the same time.